Newton Mearns is located on the outskirts of Glasgow, and remains a popular place for families to live due to its close proximity and easy commute to Glasgow city centre, but also for being less than 25 miles from the beautiful Ayrshire coast. There are many great reasons Newton Mearns and East Renfrewshire are considered some of the best suburbs to live in the West of Scotland, perhaps none more so than the excellent choice of top ranking schools, parks, sports and leisure facilities, bars and restaurants and shops, all within easy reach. There are also several historic buildings and museums run by National Trust for Scotland in close proximity. As Easter falls early this year we know families are looking for ways to entertain their children not just over the long Easter weekend, but during the two-week school holiday, which begins a week later. With the greatly improved weather of late, we also know children will be itching to explore the great outdoors. Here we look at some of the events you can enjoy over the coming weeks and all within a 15-minute drive of Newton Mearns. Within Newton Mearns, Greenbank is a quaint National Trust house with walled gardens, built for Robert Allason in the 1760s. The beautifully kept educational gardens also have large musical instruments and toys for children to enjoy. From March 25th to March 28th you can take part in the annual Easter Egg Hunt, whereby children can follow the clues, solve the puzzle and claim a chocolatey reward. Each Cadbury Easter Egg Hunt is completely different so you can take your children several times. Find out more here. Whitelee Windfarm is hosting a range of events over the Easter holidays. All activities are free and events include an Easter Bunny face-painting workshop on 25th March, Good Friday. From March 26th to March 28th there are several events taking place including a science and engineering workshop and craft workshop. On Easter Sunday 27th March ‘A Cracking Day Out’ with the Whitelee Windfarm rangers includes a variety of events from a best dressed egg competition, to the annual egg-roll and an ‘eggstacle’ challenge. Find out more here. Queens Park, Glasgow is holding an Easter Pets event between April 5th and April 7th. Animals from Pollok Country Park and Tollcross Children’s Farm, including rabbits, chickens and a highland cow, will be visiting. This is a free event, and you can also visit The Glasshouse and soft play area within. Find out more here. This popular shopping centre will be running an Easter Egg hunt in the mall in the run up to Easter. On Easter Sunday you can ‘Meet The Easter Bunny’ and there are Kung Fu Panda events taking place from April 4th to April 7th. From April 11th to April 14th the Avenue is holding a traditional craft workshop including cupcake decorating, a spring and Scarecrow craft zone, a springtime children’s tattoo zone and sand art bracelets and spring bugs sand art. Find out more here. This Easter in Giffnock children can explore the town to win Easter prizes. All you need is a special Easter Egg Hunt map, and children can collect stickers to fill their page and collect a prize from the Chest Heart & Stroke Scotland Boutique (172-174 Fenwick Road). Collect stickers up to April 23rd. Rouken Glen is a beautiful park with a waterfall, large pond, café, large newly built adventure playpark, walled gardens and garden centre. On Easter Sunday, the annual Easter Eggravaganza features fun outdoor games such as egg decorating and rolling, Easter egg hunting, scavenger hunts and more! Booking is essential. Find out more here. There are several shows for families on over Easter including the fun packed show ‘The Dragon Who Hates Poetry’, ‘Puss in Boots’ and ‘The Historic Fart’. Booking for these fun, interactive shows is essential. Dams to Darnley Country Park is a partnership project between East Renfrewshire and Glasgow City councils. This park runs between Barrhead, Darnley and Newton Mearns. On April 12th the park is holding a free event ‘Holiday Hijinks’ whereby children can join the countryside rangers for some fun and games. Find out more here. There is so much to do within Pollok Country Park, including the lavish Pollok House managed by the National Trust for Scotland, The Burrell Collection, the old stable courtyard, walled gardens, glasshouses, and riverside walks. There are also several cafes. Over Easter there are several events in Pollok House including a Cadbury Easter Egg hunt from March 25th to March 28th, a Minibeast Safari on April 4th and a Woodland Walk on April 5th, whereby you can take a walk with one of the naturalists to find out why woodland is import to all life. Find out more here. Located in East Kilbride, Calderglen Country Park is a popular family attraction featuring a tropical glasshouse, children’s zoo, ornamental gardens, nature trails and walks, courtyard cafe, adventure playground and an 18-hole golf course. Over Easter there are several events taking place including The Mad Hatter’s Tea Party on March 28th, which is a family event with crafts, storytelling and a walk through a rabbit hole. On the March 28th and March 29th the Animal Easter Event will be held in the conservatory. 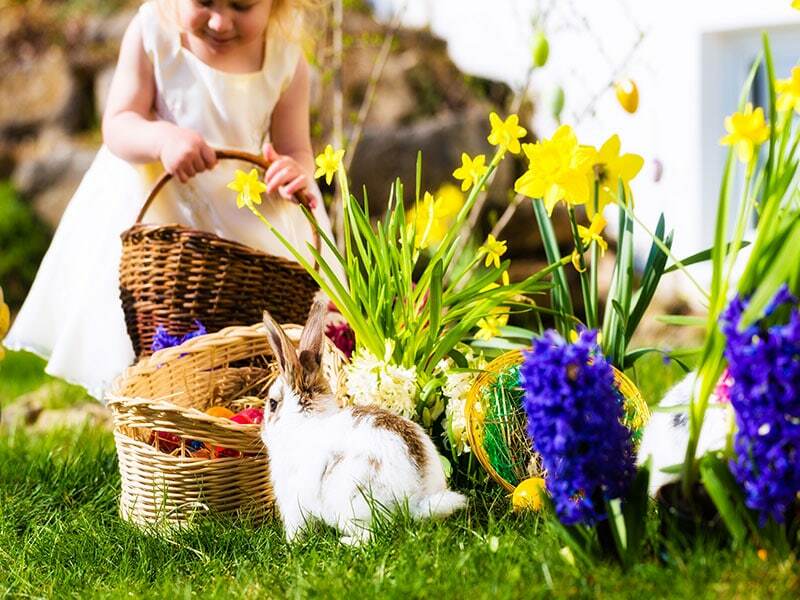 From March 24th to April 17th there is an Easter Egg Treasure Hunt on every day whereby children can explore the conservatory, ornamental gardens and zoo for clues. From April 4th to April 8th the Park is also holding an Insectivore Week where children will get the chance to meet some of Calderglen Zoo’s friendliest animals. Finally, there are craft workshops being held all over the holidays. Find out more here. This five-star attraction includes a farming museum with café and gift shop, outdoor playpark and a 1950s working farm reached by a fun tractor ride. This Easter children can see newborn lambs and calves. On Easter Sunday there is a Fun Day whereby children can meet chicks, rabbits and the new spring arrivals at the farm. There’s also the chance to try some craft activities and follow the egg trail to find the Easter Bunny. Find out more here. We know Newton Mearns and East Renfrewshire are fantastic places to live and with so much going on all year round that you are sure to find something to suit your individual taste. If you would like more information on the local area, what’s happening or would like to find out about available properties in the area please don’t hesitate to contact us at Nicol Estate Agents.